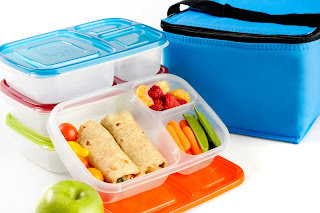 With Back-to-School sales happening now, and that first day of school fast approaching, now's the time to think about your most important school "supply" of the year - the healthy lunches your child needs to thrive with the nutrients to help learn and focus all day! 1. First you need a plan. 2. School-safe products and ideas. My friend Keeley at The Keeley McGuire Blog has a Little Miss who is allergic to peanuts. Since so many tree-nut products are processed in facilities or equipment shared with peanuts, they just avoid it all and run a nut-free home. So her blog is a great resource for school-safe products and brands as well as fun lunches and school-safe, lunchbox-sized recipes. 3. 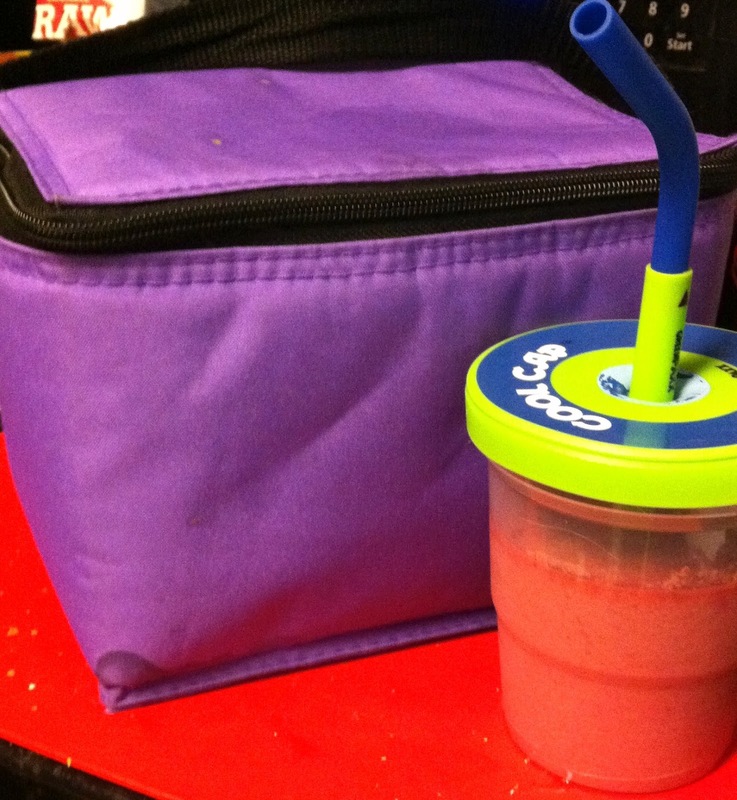 A safe, re-usable, lunch container. You could use cloth baggies and a lunch box, but I prefer the protection of the hard bento-style boxes. No crushed chips or smooshed sandwiches! And I can pack more realistic serving sizes for my child, versus just filling a baggie with each item. A serving of Cheetos, for example, should NOT take up the same amount of space as apple slices or carrot sticks in her lunch, which is a common error when packing with baggies. It's just instinctual to fill whatever sized container you have. Plus kids (and adults) tend to expect their serving dish or container to be filled. (Think about it - one scoop of ice cream on a cone is a nice dessert. Plop that scoop in a bowl and it just doesn't look like enough!) That's why I use small compartments or containers (usually mini muffin cups) for treats, and larger ones for healthier items. I prefer the EasyLunchboxes for many reasons: They're the perfect size for us. The larger compartment is the right size for a salad, sandwich, or up to four reusable muffin-cup dividers filled with different options, which offers a lot of versatility. And my little girl can open and close the lids herself. When many kids are only getting 20-25 minutes for lunch (which includes the time it takes to get to and from the lunch room,) making everything easy to open is a must! 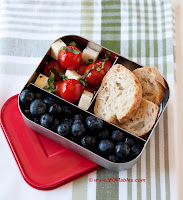 There are many other great lunch box choices out there too, such as Goodbyn, and Laptop Lunches in safe plastics; EcoLunchbox, LunchBots, and PlanetBox in stainless steel. Insulated Thermoses are another must-have option to add with a lunch box, for sending soup, pasta, or other foods you want to keep hot. 5. And most importantly, Love! The very best way to pack a lunch with love is to give them healthy options so they can learn to make and enjoy healthy choices. Fresh fruits and veggies, a balanced meal (dairy, protein, grains, etc,) and only a small amount of dessert, treats, or junk food. Hey, anything's okay, in moderation! 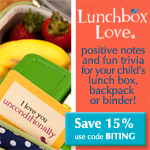 And a great way to pack a lunch with a little extra love is by making it fun! Sandwich cutters, such as Lunch Punch and FunBites, as well as other fun mini and regular-sized cookie cutters are another easy way to make lunches fun. a Lunch Punch, mini cutters, mini cup, and LOVE! Disclaimer: This post was in no way solicited, endorsed, or rewarded by any of the products or companies mentioned. I did use affiliate links where possible, however, so if you happen to buy anything through my links, I make a small percentage of the sale. If so, thank you! aww you're the bestest :) thanks for the shoutout!